Celebrity Cruises has long been a cruise line with just two ship classes -- Millennium and Solstice -- and all of its vessels (except Celebrity Xpedition) fit neatly into them. 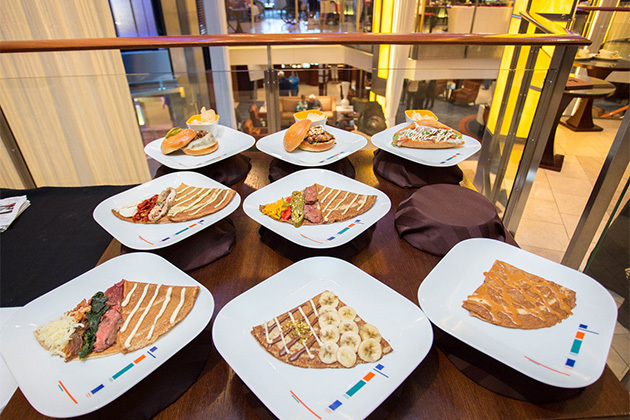 With Celebrity Edge's debut in 2018, the line introduced a third class, blending the best of the previous classes with all new innovations. For instance, Celebrity Edge introduces the Rooftop Garden, which takes the greenery of the Lawn Club, found on Solstice-class ships, and combines it with the rooftop lounge vibe of the Rooftop Terrace, which is a staple for the Millennium Class. In some ways, the ships offer similar experiences. All have an upgraded suite class with exclusive dining in Luminae, all have expansive spa facilities with the spa cuisine-focused Blu dining venue and all have an Oceanview Cafe, Mast Grill, Martini Bar and Sunset Bar, among other similarities. But the differences do outnumber the similarities. To help you decide which class is right for you, we compare and contrast to help you choose which Celebrity Cruises ship class is for you: Solstice or Edge. The Solstice Class comprises Celebrity Solstice, Celebrity Silhouette, Celebrity Reflection, Celebrity Equinox and Celebrity Eclipse. So far, the Edge Class only has one ship, Celebrity Edge; three more ships are planned for this class, one scheduled to debut each year from 2020 through 2022. Choose Solstice Class if you want more choice. There are five cruise ships in Celebrity's Solstice Class, giving cruisers more choice about where to cruise, as well as what they will find onboard. Between the five ships, you can choose from sailings that go to Alaska, the Bahamas, Europe, the Caribbean, Hawaii, South America and Australia & New Zealand. Choose Edge Class if you prefer the newest and coolest. If you prefer everything shiny and new, you'll want to select Celebrity Edge for your next Celebrity cruise. 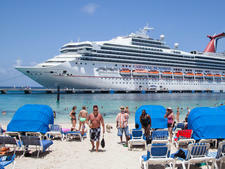 One of the most revolutionary cruise ships to debut in the last several years, Edge features a number of never-before-seen innovations, including the Magic Carpet, a tennis court-sized platform that hangs off the side of the ship and can move between Decks 2 and 16 to serve as a temporary deck extension. The ship is also gorgeously modern, with a chic boutique hotel look. Dining is perhaps the one area in which the two classes of ships differ the most, with almost none of the same restaurants found across both classes. Choose Solstice Class if you like Celebrity's signature specialty restaurants. If you're a fan of Celebrity's popular specialty restaurants like Murano, Qsine, Tuscan Grille or Silk Harvest, you'll want to choose one of Celebrity's Solstice-class ships. Although not all of these are on every Solstice-class ship, it's only on these ships that you'll get the full menu these eateries offer. Choose Edge Class if you want more complimentary dining choices. If you're looking for a little more variety when it comes to the main dining room experience, the Edge-class ships will all have four main dining rooms, each with a different atmosphere and slightly differing menus. Seventy-five percent of the menus at the four restaurants (Normandie, Tuscan, Cosmopolitan and Cyprus) will be exactly the same, but the remaining dishes will be specific to each venue -- French in Normandie, Italian in Tuscan, Mediterranean in Cyprus and general dishes in Cosmopolitan. Both Solstice- and Edge-class cruise ships offer a sophisticated outdoor experience, with appealing pool decks and open spaces that incorporate greenery and ocean views. Alfresco options range from glass-blowing demonstrations at the Lawn Club on select Solstice-class ships to soaking in a two-deck martini-shaped hot tub on Celebrity Edge. Choose Solstice Class if you enjoy the feel of real grass. 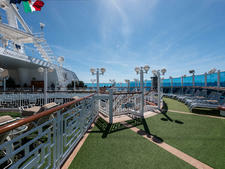 All Solstice-class ships feature the Lawn Club, a real grass lawn on the top deck, where cruisers can lie in the sun, have a lunchtime picnic or play bocce. Bring a blanket (or ship-provided pool towel), or get there early to snag a hammock or Adirondack chair. Depending on which ship you sail, you might also find a glass-blowing pavilion, where demos and hands-on classes are held, or the Lawn Club Grill, where you can barbecue your own dinner with the guidance of a chef. Choose Edge Class if you like the feel of an upscale resort pool or rooftop terrace. Like so many of the spaces on Celebrity Edge, the main outdoor spots are more reminiscent of land-based resorts and hotels than of other cruise ships. The two-level "resort" deck features a ramp that seamlessly blends the lower level and pool area with the upper sun deck. 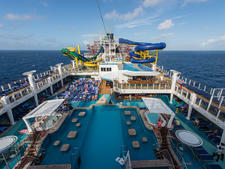 Also tying the two spaces together are two-deck-high martini-shaped hot tubs. Higher up on the ship, the Rooftop Garden evokes the feel of an urbane New York City hotel at which the rooftop terrace is the place to be. Cabins are fairly uniform across both classes, particularly when it comes to standard cabins and suites, but there are two big differences. Choose Solstice Class if you just want a "regular" cabin. You'll find more standard inside, ocean-view and balcony cabins on the Solstice-class ships than you will on Celebrity Edge. 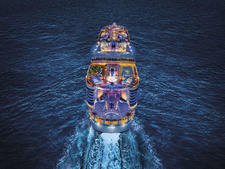 Choose Edge Class if you want magic balconies, solo rooms or new-to-Celebrity suites. The Edge-class ships feature several brand-new categories of cabins, including Infinite Verandas, Iconic Suites, the Edge Villa and rooms for solo cruisers. The most innovative of the bunch are the Infinite Verandas, which bring the balcony into the cabin, making the space about 23 percent larger. When bifold doors are closed, a window can be opened to create a true balcony feel. With the bifold space open and the window closed, the extra space serves as a lovely sunlit nook. Sixteen of these rooms will be designed for solo cruisers. Celebrity Edge will also have 7 percent more suites than the Solstice-class ships. Among the choices will be two two-bedroom Iconic Suites, each located above the bridge and measuring more than 5,000 square feet. Also new are six two-level Edge Villas with balconies that each feature a private plunge pool.